Ezra Koenig spends a lot of his time thinking about, well, time. For the past 10 years, Koenig has fronted Vampire Weekend, a punchy indie-rock band that's gained a reputation and a loyal following for its sardonic, playful wit. Today that group is releasing its first new music in years. The two songs, "Harmony Hall" and "2021," come from an album to be released this spring that's called Father of the Bride, as Koenig revealed when I spoke with him yesterday afternoon. 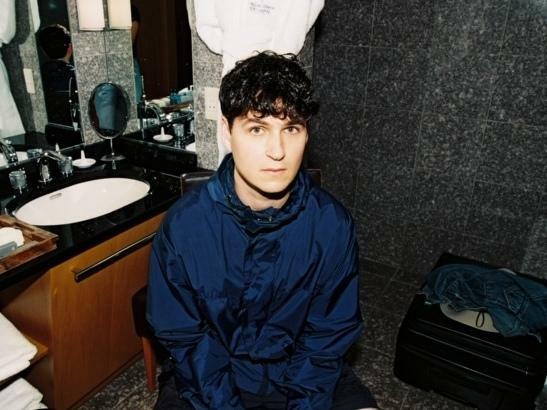 In our conversation, Ezra Koenig talked about the changes in his life and his band, and the way his preoccupation with the concept of time snuck into the recording process. "I guess when you take six years between albums, time can be on your mind a little bit," he says. You can hear traces of that perspective in both of the new songs. "It's never totally been a conscious thing. It's just such a classic thing to write songs about. ... [Time is] the biggest regret. Yeah. It's a mystery. It's the unit of life." Koenig says he made the 18 songs that will appear on Father of the Bride the way most Vampire Weekend songs have always been made: starting with a couple of people sitting in front of a computer and later fleshed out with live instruments and ornamentation. He says "2021" was based on a sample of synths drawn from a song by the Japanese musician Haruomi Hosono. "He made this music to be played in MUJI stores in Japan in the '80s. So this music was composed to be kind of ambient tone-setting music for your shopping experience." The song needed something else, he says, so he and producer Ariel Rechtshaid, his main collaborator on the album, recorded Jenny Lewis singing the word "boy" and then pitched it to fit in with the rest of the song. The basis of "Harmony Hall" is Rechtshaid and Koenig playing together, but it also includes contributions from other well-known musicians. "We have some great people. Greg Leisz, who's kind of a legendary dude, plays guitar and a little bit of pedal steel," Koenig says. A tiny bit of guitar you hear as the song is ending is played by Dave Longstreth from Dirty Projectors. Rostam Batmanglij, who co-founded Vampire Weekend and produced its first three albums but split from the band in 2016, also contributed to the new album, including production work on parts of "Harmony Hall." Koenig says that the music on the new album meant that when Vampire Weekend tours for the new record, they'll need to expand their live band to seven musicians. "We just knew we could not pull it off with four people. And also it kind of seemed more fun to get more people on stage," he says. "We did a lot of touring with just four guys on stage and there's something about having seven people and a little more equipment that makes revisiting the old stuff more fun. It makes interpreting the new stuff more fun."